The rights-based approach to family planning treats individuals as full human beings in their own right, as active agents, not as passive beneficiaries. NAY PYI TAW, Myanmar - To mark World Population Day 2018, a ceremony was held in Nay Pyi Taw on 11 July. The event celebrated the 2018 World Population Day theme Family planning is a human right. Jointly organized by the Ministry of Labour, Immigration and Population and UNFPA, the event was held in the Thingaha Hotel convention centre. The ceremony was attended by HE U Myint Swe, Vice President of Myanmar; HE U Thein Swe, Union Minister for Labour, Immigration and Population; and Ms Kaori Ishikawa, UNFPA Deputy Representative for Myanmar. The Teheran Proclamation dispelled any notion that family planning should be imposed by the state for purposes of population control. Instead, the proclamation laid down firmly the principle that family planning is a human right for couples to exercise. World Population Day 2018 commemorates this landmark agreement, and it celebrates family planning as an individual right. The Programme of Action from the 1994 International Conference on Population and Development in Cairo further moved population policy and programmes away from a focus on the number to a focus on human lives. It put the emphasis where it should be: on improving the lives of individuals, and increasing respect for their human rights and dignity. For UNFPA, this principle is enshrined in our core mandate to accelerate progress towards sexual and reproductive health and reproductive rights. Despite tremendous progress since 1968, hundreds of millions of women, men and young people worldwide are unable to exercise the right to plan their families. Thanks to a concerted effort in Myanmar by the Government, the United Nations, NGOs and other actors, half of married women in Myanmar are now able to practice family planning. Still, one in six women have an unmet need for contraception. This means that although they would like to, over two million women and their partners cannot exercise their human right to plan their families. This leads to unintended pregnancies, unsafe abortions, and maternal and infant death, and it limits women in their education, work and career choices. 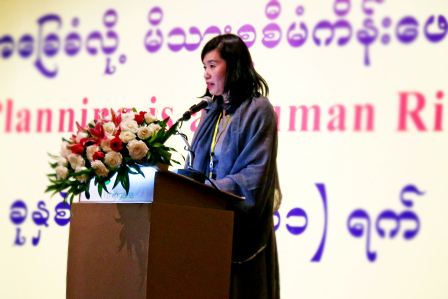 Ms. Kaori Ishikawa, Deputy Representative for UNFPA Myanmar, at the World Population Day ceremony in Nay Pyi Taw. Access to voluntary family planning enables women to space their births, benefiting both mothers’ and children’s health. Women who have fewer risky births, healthier pregnancies and safer deliveries face lower risks of death and improved overall health. Their babies are born healthier and their children’s health is better early in life. These improvements in health produce an array of economic benefits: greater investments in schooling, greater productivity, greater labour force participation and, eventually, increased income, savings, investment and asset accumulation. It is estimated that a staggering 246,000 abortions take place in Myanmar every year. Many of these are performed in unsafe conditions, and women are dying as consequence. Thanks to data from the 2014 census, we know that some 2,800 women die needlessly every year from pregnancy related causes, many of whom are young women. In fact, pregnancy- and childbirth-related complications are the number-one killers of girls aged 15 to 19 in developing countries. This is why family planning in the form of comprehensive sexuality education and access to contraceptives forms the basis for the right of young people to wait to have a family, and why it protects their lives. By respecting the right of adolescent girls to prevent pregnancy now and to have a family later, we also help keep girls in school and open up their opportunities to join the paid labour force and participate in the economy when they graduate. The more information young people have, the better choices they can make to be able to fulfil their futures. As you have heard, the right to family planning permits the enjoyment of other rights, including the rights to health, education, and the achievement of a life with dignity. An informed rights-based approach to family planning is the most cost-effective intervention for tackling maternal death and illnesses. Ensuring universal access to reproductive health services, including family planning, can ultimately speed-up a country’s progress towards reducing poverty and achieving global development goals. Over the past five years, Myanmar, with the support of the UN and other partners, has made impressive progress towards expanding access to voluntary family planning and reproductive health. Thanks to voluntary family planning, millions of women in Myanmar are empowered to plan their families and plan their lives. They can pursue more education, seek and keep better jobs, and contribute more to their families, their nation and to global prosperity. As they becomes better-off financially, their children receive better education, and the benefits carry over well into future generations. Globally, UNFPA is pursuing three transformative goals: Ending unmet need for family planning; ending maternal death; and ending violence and harmful practices against women and girls. The theme for this year’s World Population Day “Family Planning is a Human Right” firmly supports these transformative goals. What we have seen in the last 50 years is a paradigm shift in the field of population and development, replacing a demographically driven approach with one that is based on the rights of individuals and couples to decide freely how many children to have, and when to have them. The rights-based approach to family planning treats individuals as full human beings in their own right, as active agents, not as passive beneficiaries. This approach is built on the explicit identification of rights-holders and duty-bearers. The rights-holders are individual women and men. The duty-bearers are the people in power that are responsible for delivering on these rights. Many of us here today are duty bearers with responsibilities to the people of Myanmar. On this World Population Day, and on all other days, let us celebrate family planning as a human right. Let us work together to ensure that all women in Myanmar, no matter who they are or where they are, have access to a full range of contraceptive options on an equal basis, so that no one is left behind.